The case of Banda Singh Bahadur presents perhaps, the strangest array of difficulties and paradoxes in the whole range of Sikh Biography. No biography of his, written during his life time by any of his admirers or impartial writers, has no far been unearthed to give us 'first-hand and reliable information on his life and work. No doubt, there are works by Bhangu Rattan Singh Sahid. Bhai Santokh Singh and Bhai Gyan Singh with chapters on him there are sketches by Daulat Singh, Sohan Singh, and Karam Singh, and there are sections allotted to this subject in almost all the books that deal with the rise of the Sikh nation. But unfortunately no account of Banda Singh so far written by a contemporary or a later writer-Muslim, Hindu, or Sikh- exhibits his true character. 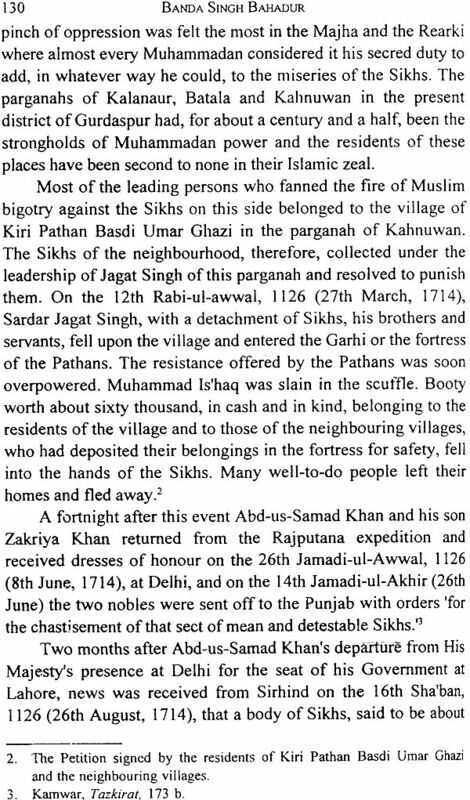 The struggle of the Sikhs, against the intolerance and Iniquities of the Mughal rulers has been erroneously interpreted into a religious campaign of the Sikhs against the religion campaign of the Sikhs against the religion of Islam, or into a rebellion of the Kufaar against the rule of the Momins. 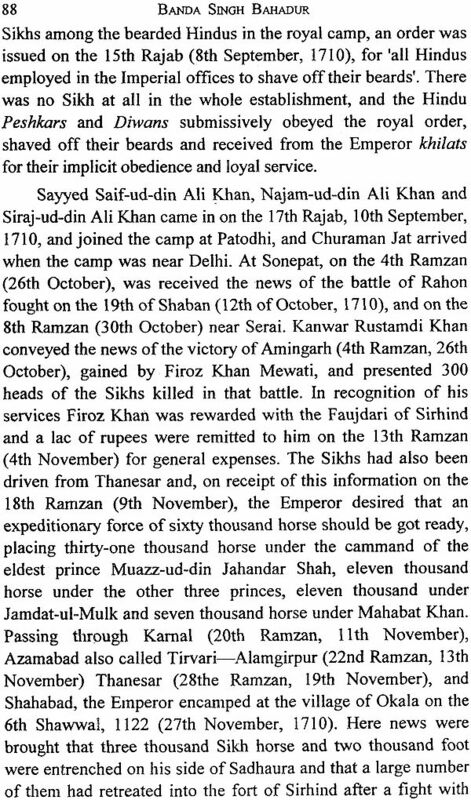 The Accounts of Persian histories, like the Muntakhib-ul-Lubab of Khafi Khan, the Siyar-ul-Mutakherin of Ghulam Hussain Khan, etc. are,under this impression, influenced by their pro-Islamic against the non-Muslims. 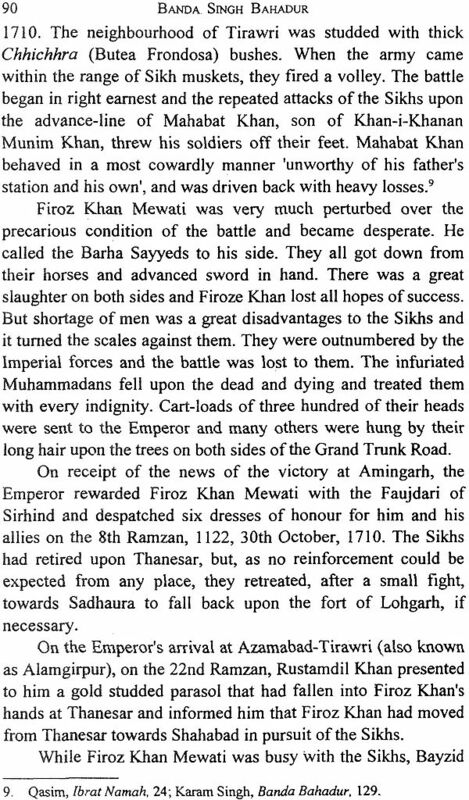 They have readily accepted false and flimsy rumors as historical truths and have charged Banda Singh with the blackest cruelty and barbarism, which 'had Infidels been the sufferers and a Mussalman the actor, says Mills, they might not, perhaps, have thought unworthy of applause'. Most of the English writers also have followed these historians and have believed them implicity. But, with all this, it cannot be denied that the historical honesty of the Persian writers too often prevails over other considerations and that their writings preset much less difficulty to the discerning eye of a research student. 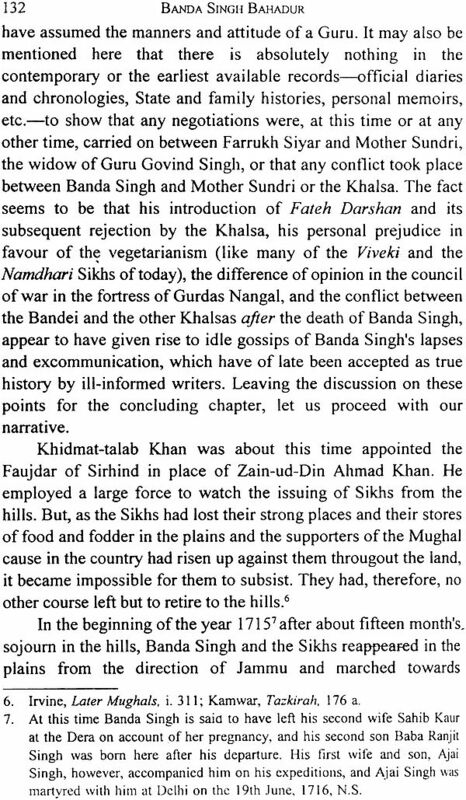 Not only for this, but even otherwise, in the absence of any contemporary Sikh records, we have to depend, for the history of the first half of the eighteenth century, mostly upon the writing and records of Muslim historians, diarists and officials. The works of Sikh writers on the subject—particularly of Bhai Gyan Singh though they are of great value in supplying us with details, are sometimes tarnished by their love for poetic exaggeration. Not merely do they sometimes adopt a partisan attitude, but they allow their judgement of men and matters to be clouded by sectarian partiality. 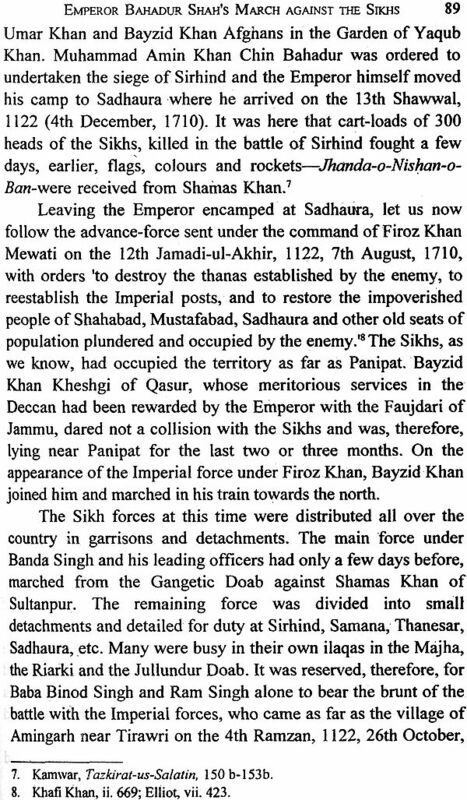 The life-history of Banda Singh has suffered the most at their hands under wrong notions. He has been slandered for and accused of things of which he was never guilty. 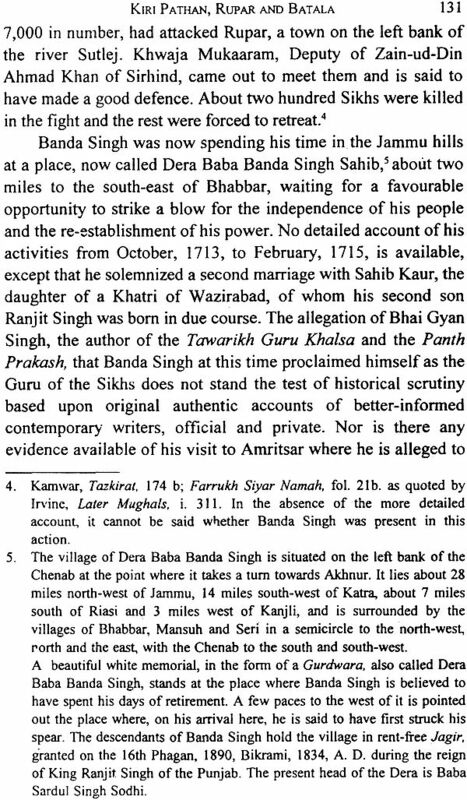 Bhangu Rattan Singh is a Sikh writer of integrity and is generally reliable, though his account of Banda Singh is faulty on certain points. 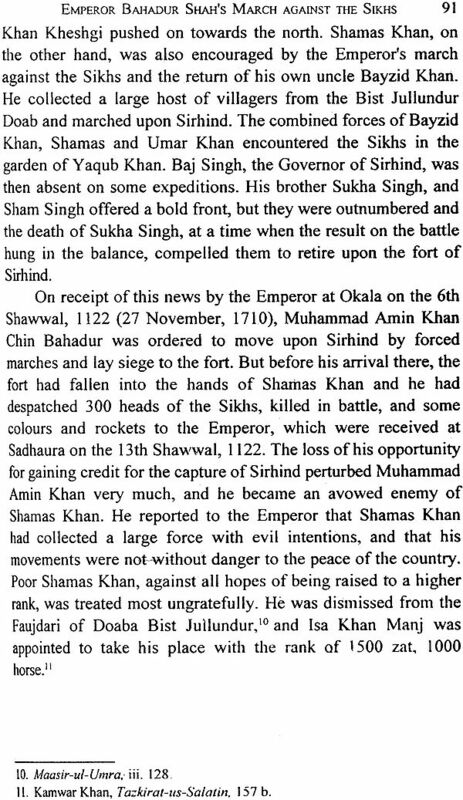 He was the grandson of Bhai Mehtab Singh of Mirankot, who had either been personally through the unpleasant conflict between the Bandei and the other Khalsa, after the death of Banda Singh, in 1721 or had heard-accounts of it from his father and others. He is the first writer to introduce the subject of negotiations between Farrukh Siyar and Mata Sundri which appear to have been based on hearsay and wrong information. 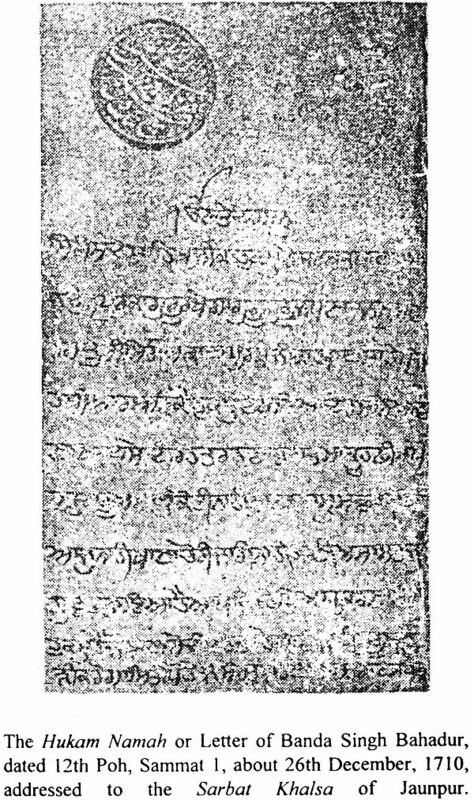 In writing on Banda Singh, Bhai Santokh Singh, the author of the unparalleled scholarly work, the Suraj Parkash, in the absence of any contemporary records at his disposal, has not been able to penetrate beyond the crust of the then prevalent accounts. He considered all the previous Punjabi works on the subject, from the Mahma Prakash, both in prose and in poetry, to the Sau Sakhi and other similar works, as equally authentic. 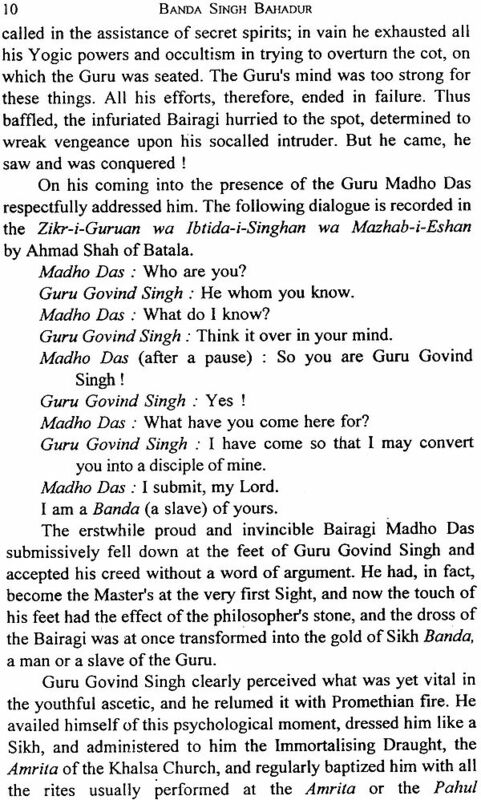 Bhai Gian Singh in his Panth Prakash and the Shamsher Khalsa has accepted the popular stories and could scarcely make any distinction between him, who related events at which he had himself been present, and him who about two hundred years later composed a fictitious novel. He is an off hand writer and is sometimes fanciful and imaginative. Precious elements, in his works, are sometimes mixed up with baser one in such a manner that to separate them is a task of the utmost difficulty. 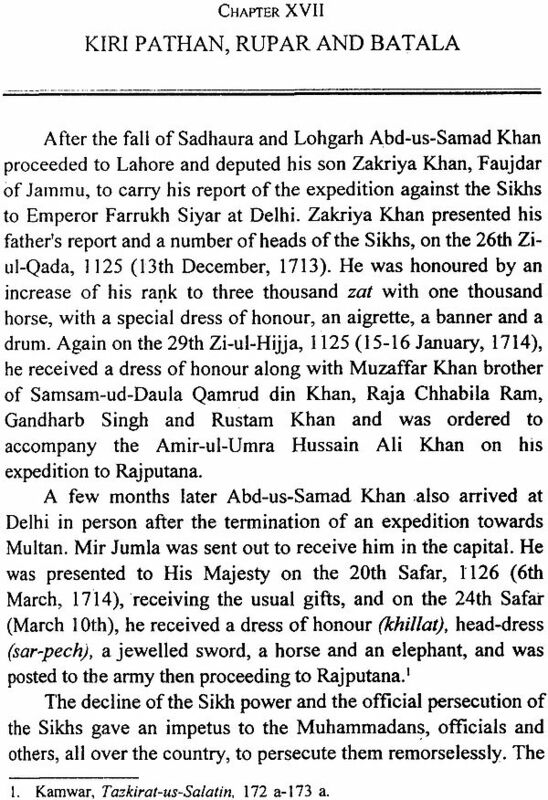 The late Sardar Karam Singh attempted a scientific biography of Banda Bahadur in 1707. He studied all the Persian writings that he could then find along with the Punjabi sources and made unavoidably crept into his work. He was an honest historian and when the truth dawned upon him after more extensive study of over twenty years he frankly acknowledge and rectified his mistakes. 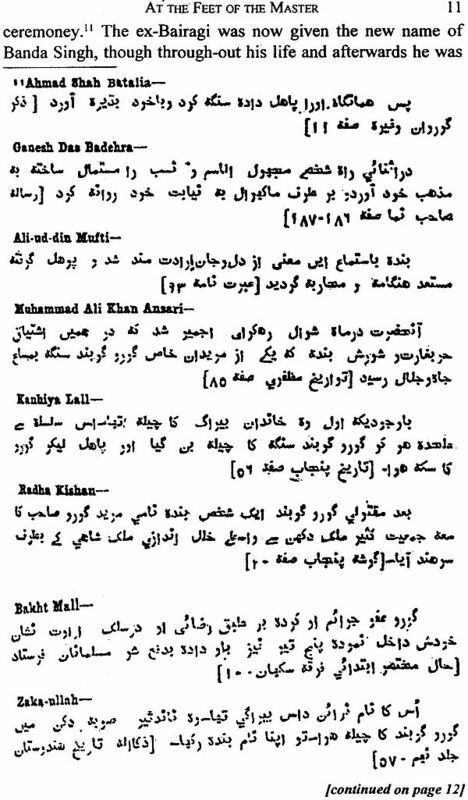 His Banda Kaun tha published in 1921 is a testimony to it. 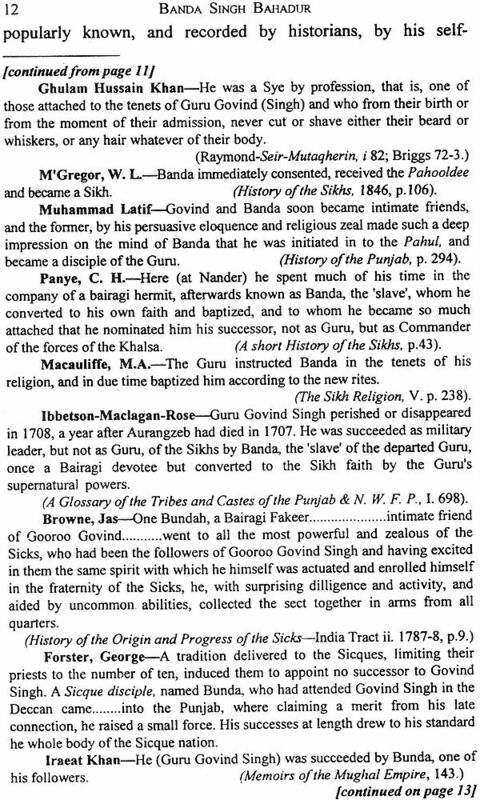 Unfortunately he was soon snatched away by the cruel hand of death and the unrecorded results of his life long researches in Sikh history of the eighteenth century were lost to us for ever.